We’d love your help. 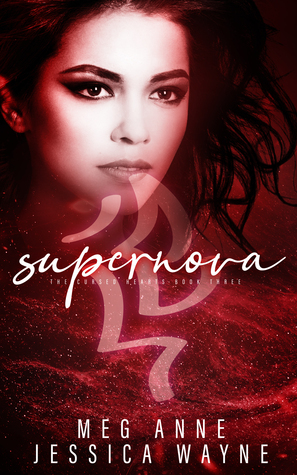 Let us know what’s wrong with this preview of Supernova by Meg Anne. A master at piecing together the clues others often miss, Lucas is backed into a corner when the Druid manages to trick him. Love is the only light Skye Giovanni can find during the darkest moments of her life. To ask other readers questions about Supernova, please sign up. This is the final instalment in Jessica Wayne and Meg Anne’s Cursed Hearts Series and honestly, it was incredible. I wasn’t sure what was going to happen next after the way they ended Amria, but they managed to handle Skye’s disappearance amazingly. Seriously, these two authors have such incredible talent alone, but when they are together their talent is just way too high…. Once you get a taste of their writing, you can’t help but just want more and this book they did such an amazing job with th This is the final instalment in Jessica Wayne and Meg Anne’s Cursed Hearts Series and honestly, it was incredible. I wasn’t sure what was going to happen next after the way they ended Amria, but they managed to handle Skye’s disappearance amazingly. Seriously, these two authors have such incredible talent alone, but when they are together their talent is just way too high…. Once you get a taste of their writing, you can’t help but just want more and this book they did such an amazing job with the journey they took the characters on. The twists and turns that they threw at us were incredible and they had such a huge impact on the story. I couldn’t find a single fault with the story, the plot flowed together nicely and the characters were just right. The only thing I will say is that, I would have liked to have had more of what happened in the end, I would have like to have seen how the characters coped after everything they went through. We only got a brief look at it, but I would have liked a bit more, other than that, they both did an amazing job. Lucas is worried about what he’s going to do when it comes trying and defeating the druid that’s after them… Now with the family secrets all out in the open, it’s not as easy as it should be because a lot has changed. Skye’s currently no where in sight, but after finding the note that she left him, he has no idea that she’s actually disappeared against her will….. Lizzie seems to be the only one who has faith in Skye, but she knows they need to find her in order to take down the Druid. Will it be too late for them to get to her or will they succeed and finally take him down for good? There’s a lot at stake and there’s more secrets that are about to unfold for them all. Supernova is a very intense conclusion to this trilogy. There are so many emotions! These authors did an amazing job making me really feel what these characters were feeling. In the beginning of this trilogy it was hard for Lucas and Lizzie to even accept what Sky I have come to love Skye, Lucas and Lizzie during the last two books, so I needed to know how it would all play out in this last book of the trilogy. As you can tell from the blurb, Skye is kidnapped and needs to be saved in this book. There is a lot of action in this story. Finding Skye, chasing the Druid, figuring out how to break a curse. It's all done in one book! I don't want to spill too many details for the people who need to get caught up of course, but you'll definitely want time to give this book your full attention. That being said, because so much had to happen in the final installment, things felt a bit quick at times! And that's the only negative thing I have to say about this book. I just want more! On top of a lot of action, some pretty fun information about Druids and spells, an amazing setting (who wouldn't want to live there?) and great characters, these authors make their story a bit more unique by adding some family history to it all. I love the things they learn on their journey and how shocked they are to figure out they're more connected to everything than they realize. Besides the action and family aspect, I loved the romance between Skye and Lucas, but also between Lizzie James. Those parts of the story had me smiling. They all just fit together so perfectly! I could really rant about this book, but all I can say is that I'm very happy with this ending. There is even some girl power in the end that I didn't expect! This is the third book in the Cursed Hearts series, and you most definitely need to read Star-Crossed (Cursed Hearts Book 1) and Amria (Cursed Hearts Book 2) before reading this book. The fearsome foursome - Skye Giovanni, Lucas MacConnell, James Matthews and Lizzie MacConnell – are in a fight for their lives. I cannot begin to tell you how much I loved this series! Ms. Anne and Ms. Wayne did a fantastic job with these characters! I was sucked in from the first page to the last. There was a lot o This is the third book in the Cursed Hearts series, and you most definitely need to read Star-Crossed (Cursed Hearts Book 1) and Amria (Cursed Hearts Book 2) before reading this book. The fearsome foursome - Skye Giovanni, Lucas MacConnell, James Matthews and Lizzie MacConnell – are in a fight for their lives. I cannot begin to tell you how much I loved this series! Ms. Anne and Ms. Wayne did a fantastic job with these characters! I was sucked in from the first page to the last. There was a lot of mystery and suspense, twists and turns, and tears of pain and joy, which kept me glued to my kindle. Skye and Lucas, as well as all the other characters need to find a way to stop that darn Druid, (who happens to be Lucas’s grandfather), from killing them all in order to maintain his power. He is up to no good and will test the powers of both Skye and Lucas, and try to tear apart Lizzie and James. This is one epic battle between good and evil, light and dark! Bravo ladies on a series that is simply fantastic! I highly recommend this series! Supernova picks up right where book two left off. It is set in Scotland where Lucas, Skye, and their companions come together to try and defeat the druid once and for all. Wow just Wow! What an awesome conclusion to a series filled with magic, wonder, awe and suspense! The story line in this final book is a little darker than the previous books, and, at times, it is difficult to read what poor Skye and Lucas have to endure. The stakes in this power struggle couldn't be higher as the druid nears his ultimate goal leaving just one question. In the end, will good triumph over evil? This series definitely needs to be read in order, this continues where book 2 left off. But what a great conclusion to this series. I was sucked into the book, & couldn't put it down. This does have some serious vibes for quite a bit of the story & even an occasional tear or snuffle for the couple & all they were going thru physically & emotionally (but definitely not a Kleenex inducing ugly cry). I really liked Skye & Lucas, even his sister Lizzie Read with Kindle Unlimited. As the author wrote, “Love is what gives life meaning.” That quote pretty much sums up this series. No matter how much torture, physical and emotional, the characters went through, they were able to endure it because of love, true love. The second book ended on a big cliffhanger and this third one starts right off where it ended. And wow is it a tear jerker! Be ready with tissues because this book pulls at your heart strings, but don’t worry, it ends with a wonderful HEA! I received an ARC from th As the author wrote, “Love is what gives life meaning.” That quote pretty much sums up this series. No matter how much torture, physical and emotional, the characters went through, they were able to endure it because of love, true love. I received an ARC from the author. This is my honest review. I was completely blown away by this series and this ending was well worth the wait! There was so much I anticipated to happen but these two amazing woman blew me out of the water with this story! It was an adventure that relies on trust, faith, hope and love! All involved needed to be strong and had a role and that’s what I loved about this story! It wasn’t 100% Skye and Lucas! You got to see how the characters felt and it really enhanced my enjoyment of the books! I hope these two continue to p I was completely blown away by this series and this ending was well worth the wait! There was so much I anticipated to happen but these two amazing woman blew me out of the water with this story! It was an adventure that relies on trust, faith, hope and love! All involved needed to be strong and had a role and that’s what I loved about this story! It wasn’t 100% Skye and Lucas! You got to see how the characters felt and it really enhanced my enjoyment of the books! This review has been hidden because it contains spoilers. To view it, click here. Wow!! This is the perfect ending to an amazing series. The characters are just so well developed, and you really feel like you are there with them throughout the story. Spoiler warning—read no further!! The story itself is an “edge of your seat, must keep reading, need to know what happens next” thriller with the added bonus of a happy ending. While I am glad to know how this story ends, I am a little sad it’s over. I hope Meg Anne and Jessica Wayne continue to collaborate because the world need Wow!! This is the perfect ending to an amazing series. The characters are just so well developed, and you really feel like you are there with them throughout the story. Spoiler warning—read no further!! You do need to read the first two books in the Cursed Heart Series. The beginning of this book starts off intensely. There are many twists that you don't want to happen but do and will have you saying a few choice words. - Twist after twist. There are many moments I don't You do need to read the first two books in the Cursed Heart Series. The beginning of this book starts off intensely. There are many twists that you don't want to happen but do and will have you saying a few choice words. Finally it's here, the third and final book in the Cursed Heart series co-written by Meg Anne and Jessica Wayne and it was worth the wait. I really liked this series right from the start, it was full of mystery, magic, ancient lore and love. A great mix of everything that makes a great story. These ladies write a fantastic tale that makes you not want to stop reading. A must read trilogy for all. In the third book is this amazing series will leave you with so many feels and emotions you won't be able to stop reading it. Skye, Lucas, Izzy and James are fighting to save the world and themselves from The Druid . When Skye disappears and things don't look good what will they do to figure out to defeat him or will.all be lost when things don't go the way they hoped. Amazingly Epic ending that ties it all up and don't leave wondering what happens. Can't wait to read more from these ladies. This is the conclusion to the series. Lucas needs to fight his uncle who is trying to destroy him and he also needs to rescue Skye who has been kidnapped. During the fight to save Skye he is transported to wastelands and Skye must give up her life to save Lucas. We find out more about the characters and the relationship between them. The battle at the end shows the characters and how they will stand together to defeat evil. Yes, yes, yes. This book gave me all the feels. I loved it. What a fantastic, satisfying series finale! Thank you Jessica Wayne and Meg Anne for such a great trilogy and I really hope you write something together again. This was a really great book. So much suspense, amazing character development, twists I didn't see coming and twists I was sure were coming that never did. SO GOOD. Who knew that you could find out MORE about characters and relationships in book 3 of a phenomenal series?? But you do with this one!!! You think you know it all.....but do you? Everything is so flawless you would think the that it was written by one person but these two authors work so well together and are so much on the same page that you can't even tell. Phenomenal! Supernova is an intense story that provokes a lot of emotions. The things that Skye and Lucas had to endure broke my heart. There was a point where I thought their story wouldn’t end in a way I would like. Their tale was one that reinforced their love and trust in each other while proving that sometimes one has to have a little faith that things will work out. Supernova concludes Skye and Lucas’ story. The book is set in Scotland where they have to face the Druid, aka Lucas’s grandfather, and find a way to destroy him. The characters relationships strengthen in this story and the series ends in a satisfying climax. Wow wow wow!! My favorite book yet. I loved the twists and turns! And the ending was so amazing!!! Thank you jessica and meg for a fabulous series. What a amazing read that will have you on a power ride that will have you loving this ending to a amazing series. I needed this book !! Okay without any spoilers which feels absolutely impossible for this book. This book is everything I wanted it to be. Thank you Meg and Jessica I loved it. What a story. Skye has had a difficult existence, and love is the only bright light for her. Lucas might be the light. Fast paced. Ready for more. 5/5 stars. The only reason I could think of docking it a star is the book hangover you get! I didn't want it to be over. This was such an epic finale to this series. I devoured it in no time at all! A satisfying end to the series for Lucas and Skye. These two have been through the wringer. Poor Skye but I’m glad they finally got their HEA. Like any true SoCal native, Meg enjoys staying inside curled Meg Anne has always had stories running on a loop in her head. They started off as daydreams about how the evil queen (aka Mom) had her slaving away doing chores; and more recently shifted into creating backgrounds about the people stuck beside her during rush hour. The stories have been there, they were just waiting for her to tell them.